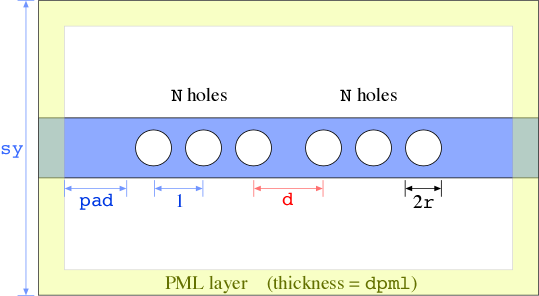 In this example, we will consider the 2d structure shown below, which is based on a system considered in Chapter 7 of Photonic Crystals: Molding the Flow of Light (second edition). In particular, there are three basic ideas behind this structure, which we briefly summarize. In the following, we will analyze the structure in exactly the opposite order of what we really should do. Really, we should analyze the periodic system first to understand the band gap, then analyze the resonant mode, and finally analyze the transmission spectrum. Since all of those calculations have already been done (see the reference in the book), however, we can jump straight to the transmission spectrum (which is conceptually the easiest computation to understand) and work backwards. See also examples/holey-wvg-cavity.py and examples/holey-wvg-bands.py which contain the commands below. Next, we'll define some parameters of our structure as in the figure above. All lengths are in units of microns (μm). The periodicity of the photonic crystal is 1 μm. To create the holes, we have used a for loop. Note that the geometry objects are combined using the append function. As usual, later objects in geometry take precedence over earlier objects, so the Cylinder objects will punch holes through the Block. Now, we can run the simulation until the sources have finished plus some additional time to allow the fields to propagate through the structure. As in Tutorial/Basics, we'll use stop_when_fields_decayed to increment the time in steps of 50 time units (about 13 periods) until has decayed by at least 1/1000 at the transmission-flux plane. Note that we've outputted ε at the beginning — this is always a good idea, to make sure the structure is what you think it is. We have also outputted the field in a slice, every 0.4 time units (about ten times per period) while the source is on, to a single file with time as the second dimension, just as in Tutorial/Basics. 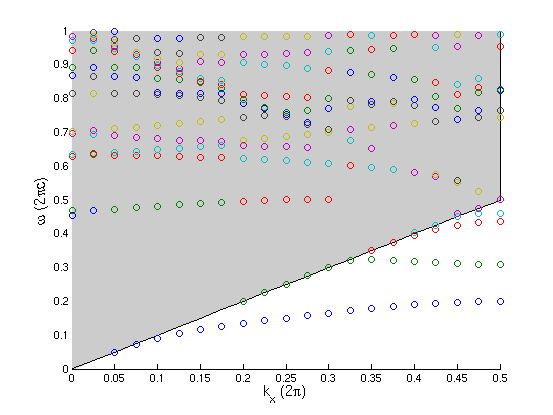 Here, you may notice a strange thing: we have specified phase=-1 for both mirror planes corresponding to odd symmetry. However, it may seem at first glance that an dipole at the origin has even symmetry! The subtlety here is that the magnetic field is a pseudovector, and is multiplied by under mirror flips, so it is odd when it looks even and vice versa. We aren't just being pedantic here — if you don't realize the difference between vectors, such as electric fields and currents, and pseudovectors, such as magnetic fields and currents, then you will have endless confusion because the electric and magnetic fields will seem to have different symmetry. See also Exploiting Symmetry. 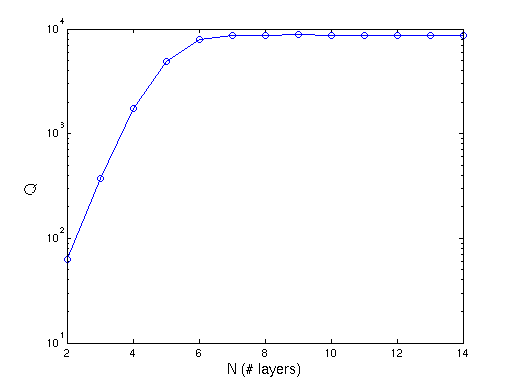 Since our structure is periodic, we don't want any absorbing layers in the direction: adding direction=mp.Y just specifies PML layers on the boundaries. Computing band diagrams, especially for leaky modes, with a time-domain program like Meep involves several subtleties. 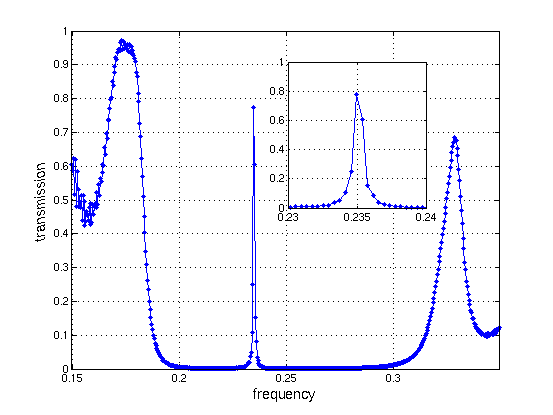 For example, the accuracy of Harminv will go down if we specify too large a df (too narrow a source), because the increased number of modes makes the signal-processing more ill-conditioned. Sometimes, Harminv will report a spurious mode, which will appear as an isolated dot on the plot. Second, we sometimes have to be careful with modes and especially the imaginary parts to make sure they aren't an artifact of the cell being too small, or the signal-processing error being too large (either because the run is too short or because the bandwidth being searched is too large). Third, currently Meep doesn't attempt to "connect the dots" for the bands — the frequencies are printed in increasing order, but since modes disappear when their losses become too large this means that a single band may be split across several columns. On the plot, this is visible as single bands composed of differently colored dots.